Friends and colleagues, Sunday 6-5-16, the EMS community lost a great man. Rich Beebe passed away as a result of injuries he sustained in an accident when a van cut in front of his motorcycle. Ironically, he was on his way home after having taught an EMS class. Rich spent more than 30 years in EMS as a paramedic, nationally known educator and author. He had a great and unique gift. Besides having the ability to present the material he was teaching, he had the ability to make his students THINK. He was comfortable teaching any level student from basic EMT students to nurses and physicians. The name of his consulting company was called Medic Think. That says it all. Rich, together with Mike McEvoy, were the Education Coordinators for NYSVARA’s Pulse Check Educational Conference for the past several years. Rich’s specialty was the BLS Pre-Conference and an original member of “The 3 Wise Men”. He truly was a wise man! Rich touched the lives of literally thousands of people. He always had a smile or a joke. He made everyone who met him feel comfortable. He enjoyed the occasional good cigar and a little bit of bourbon. At our conference, at the end of the day, a few of us would gather in front of the hotel and Rich would “hold Court”. It was a great way to end the day. I had the honor and privilege to call him my friend. On behalf of the Board of Directors and members of NYSVARA, I want to send my deepest sympathy to the Beebe family. Rich may be gone, but he will never be forgotten. Eternal peace and Godspeed my brother! Members of Service, who plan on attending are asked to wear their uniforms to honor Rich. A reception will be held at Western Turnpike Rescue Squad Western Turnpike, Guilderland NY. National champion chefs, live music, family entertainment. 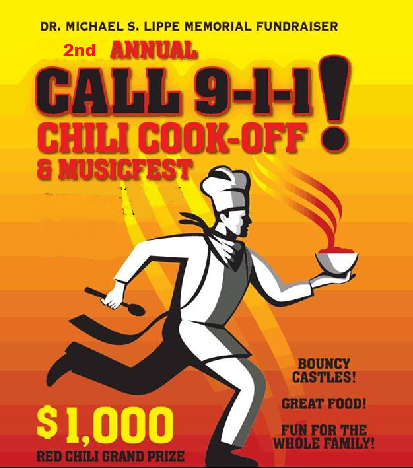 The CALL 911 Chili Cook-off is heating up. This is a Qualifier for the WCCC 2014, where ever it is held. Hoping to have 30 Cooks. $1000 first place red. It is more than annoying to have your actions second guessed after the fact, it’s even more annoying when the person telling you “how to do it better” doesn’t have the knowledge themselves to do the job in the first place.